This problem is usually big trouble in Little China, budrow, because it can be an indication that the drum bearings are shot and you have a big repair in your future. 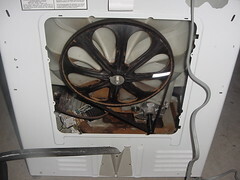 One sure sign that the bearings are the root of all evil here is if you see brown splatter all over the back of the drum and bottom of the washer, as shown here (do I really need to say, “click the picture for a larger view?”). But, fear not, my leetle grasshopper, for other grasshoppers, like unto yourself, have successfully undertaken this very repair and have emerged victorious. Yea, verily, read all about it ratcheer.